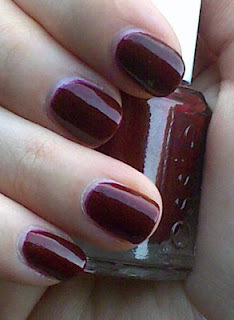 NOTD: Essence Mix - Cherry Colors - Cosmetics Heaven! Yesterday I decided that having just one color on my nails is just plain boring.. I wanted to try layering nail polishes. So I firstly put on Essie Fill The Gap as a base (tho it doesn't go well along with some nail polishes, hmm), then Essie It's Genius for the first color and then Essie Bold and Beautiful for the second color. The bad thing is that Bold and Beautiful is too pigmented for what I wanted to do, but it still came out really nice. 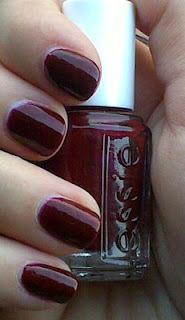 And for finish everything I put on Essie Good To Go + Essence quick dry spray. A big mess, heh? All those steps didn't take much time, since I did my manicure in a lazy way. Which means inaccurate. (natural light, without sun) But I like the result. If you look really closely (in RL) you can see the gold shimmer underneath, pretty neat.. But what do you think?